Wheels & Accessories There are 6 products. COLOR - BLACK STYLE - CLOSE END SIZE OF LUG NUT: WIDTH 24mm / LENGTH 32mm / DIAMETER OF KEY 24mm MADE FROM FORGED SCM435 STEEL , EACH LUG NUT WEIGHT 2 OZ. PRICE FOR FULL SET of 20 NUTS/HEX LOCK ETC. 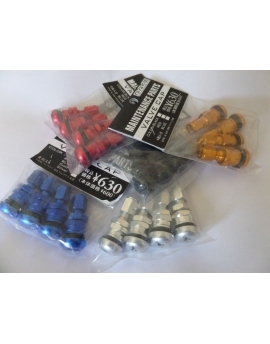 STYLE - open END SIZE OF LUG NUT: WIDTH ¬24mm / LENGTH ¬35mm PRICE FOR FULL SET of 20 NUTS/ LOCK ETC.